Manchester United are reportedly planning a HUGE spending spree for next season, according to a report from the Times. The Red Devils have been linked with a host of big names ahead of next season, with the club in need of some big spending to catch up with rivals Liverpool and Manchester City. This could see United spend as much as £448million on the targets they’re being linked with, though it remains to be seen if they’ll manage to bring them all in. Jadon Sancho to Manchester United transfer on the cards? Linked as a top target for United by the Independent, Jadon Sancho has shone at Borussia Dortmund and is now expected to cost around £100m. 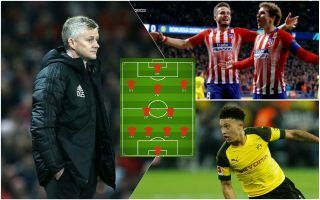 The England international would no doubt be expensive, but United could help pay for the deal by offloading the misfiring Alexis Sanchez, for whom Sancho would surely be a major upgrade on the flanks. Another outstanding English youngster, Aaron Wan-Bissaka has shone for Crystal Palace this season to attract transfer interest from Man Utd. The Mail claim MUFC could try signing the 21-year-old right-back for around £35m this summer, though Arsenal have also been linked with him.